Venerable St. Sergius of Radonezh (ca. 1314 –September 1392), also known as Sergey Radonezhsky or Serge of Radonezh, was a spiritual leader and monastic reformer of medieval Russia, and is one of the Russian Orthodox Church's most highly venerated saints. Born within the Rostov principality, the future saint received the baptismal name of Bartholomew (Varfolomei in Russian) in honor of the Apostle Bartholomew. Upon his parents' death, Bartholomew went to Khotkovo near Moscow, where his older brother Stefan was a monk. He persuaded Stefan to find a more secluded place to live the ascetic life, and in the deep forest at Makovets Hill they decided to build a small cell and a church dedicated in honor of the Trinity. After some time Stephen left, and Sergius became increasingly well-known as a profoundly spiritual figure in the Russian wilderness, attracting followers and eventually organizing them into a community that became the famed Holy Trinity Monastery. This image portrays the legend of a bear that used to come to the holy man. Seeing the animal did not come to harm him, but rather to get some food, the saint brought a small slice of bread from his hut, and placed it on a log or stump. The bear learned to come for the meal thus prepared for him, and having eaten it went away again. If there was no bread, and the bear did not find his usual slice, he would wait about for a long while and look around on all sides. At this time Sergius had no variety of foods in the wilderness, only bread and water from the spring, and these were very scarce. Often, bread was not to be found; then both he and the bear went hungry. 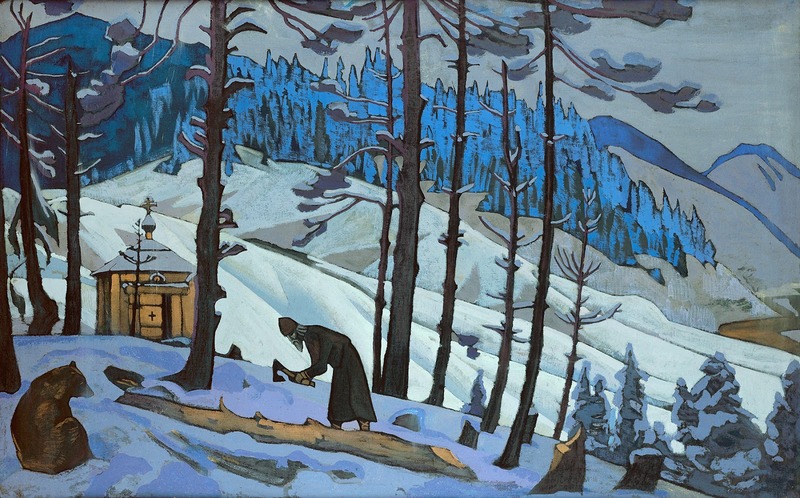 Nicholas Roerich (October, 1874 – December, 1947) was a Russian painter, writer, archaeologist, and theosophist, who in his youth was influenced by a movement in Russian society around the spiritual. He believed that although earthly temples and artifacts may perish, the thought that brings them into existence does not die but is part of an eternal stream of consciousness—man’s aspirations nourished by his directed will and by the energy of thought. Finally, he believed that peace on Earth was a prerequisite to planetary survival and the continuing process of spiritual evolution, and he exhorted his fellow man to help achieve that peace by uniting in the common language of Beauty and Knowledge. 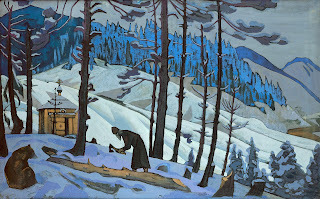 Nicholas Roerich died in Kullu on December 13, 1947. His body was cremated and its ashes buried on a slope facing the mountains he loved and portrayed in many of his nearly seven thousand works.